We are fortunate to call our home base Barrie. Our team of experts has lived in Barrie for decades, and we fully appreciate the love you have for your home located in beautiful Bruce Grey Simcoe County. We install new high-efficiency vinyl windows for any room in your home, allowing you to reduce heating and cooling costs during the hottest and coldest months of the year. Whether you live on Lake Simcoe or outside of Barrie in the countryside, our team will ensure you are set up with the functional options that are best suited to meet the unique needs of your home’s character, location, and environment. Legend has it that Barrie’s Spirit Catcher carries out dreams and desires on the shores of Kempenfelt Bay. Consider allowing our team to do the same for you. Awning windows are particularly suitable for your kitchen in Barrie. By swinging outward, they allow for improved air circulation while preventing rain and outdoor debris from entering the home. A stunning feature for any Barrie home, bay windows create bright and beautiful alcoves that can be enjoyed as a cozy reading nook or decorative green space. A traditional bay window features three window panels that extend outwards on an exterior wall. The front-facing panel is flat and parallel to the wall, with angled side panels on the left and right sides. Bow windows are a popular and attractive window choice for homes in Barrie. Similar to bay windows, bow windows extend outwards from exterior walls, but typically incorporate four or more panels. Choosing more window panels will create a rounder curve with softer angles, providing an attractive curb appeal for your home in Barrie. Casement windows are a common and practical window option to increase air circulation in the home. Casement windows are highly energy efficient as they provide a tight seal against cold weather during the winter months and humid weather during the summer months. When paired with modern window treatments, vinyl casement windows create a sleek look in any room. Our team will ensure our windows fit seamlessly into the unique window size specifications of your home in Barrie. Each window is tailored to accommodate any window shape and is masterfully fitted by our team of expert window installers. Whether you live on the lake, in the countryside, or in an older home in Barrie, our team will provide you with the best possible window options to meet your home’s needs. The two window sashes on a double hung window can open from either the top, the bottom, or both. A double hung window will allow you to manage airflow in your home, increasing overall air circulation and comfort levels. Single hung windows are built with two window sashes: a top sash fixed in place, and a bottom sash able to slide up and down with minimal effort. Choosing to install single hung windows in your home will increase curb appeal while reducing energy costs. Slider windows are constructed with one or two moving window sashes that slide horizontally on a track. These windows open and close with a gentle motion, making them easy to maintain and operate. Slider windows will allow a large amount of light to enter your home in Barrie – a particularly welcome benefit during the dark and cold winter months. By quite literally framing your surroundings, a picture window is a unique and attractive window option that will allow you to experience Barrie’s beautiful views more freely. Picture windows are also the easiest window to customize because they have no moving parts. 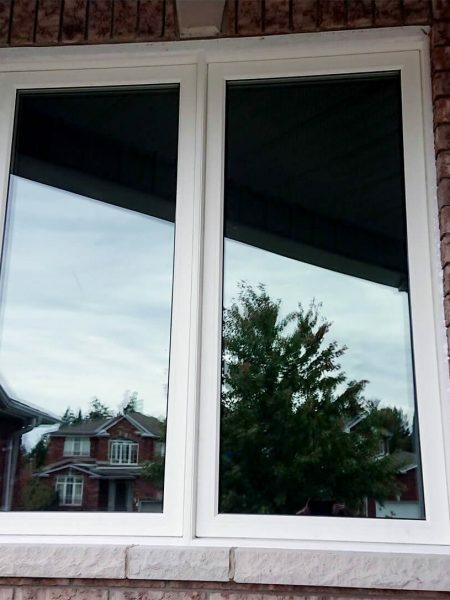 Since picture windows do not open, they are extremely secure and energy efficient, making them an overall excellent window option for your home in Barrie. At Weaver, our team of professionals has over two decades of experience installing windows in Barrie. We attribute our success to our effective and proven eight-step window installation process. From the onset of your first contact with us, we will provide a clear, detailed explanation of our services and specify how they will benefit you and your home. Our experienced tradespeople execute each and every job detail to perfection – on time and on budget. No matter the unique specifications or age of your home in Barrie, our team will expertly install replacement windows to fit any existing opening. The process of installing replacement windows is quick because no elements of the home’s exterior need to be removed. A quick installation time means window replacements are possible during all seasons and weather conditions in Barrie. Are you in the process of building or renovating a home in Barrie? When building a home from the ground up, new construction windows offer the most flexibility when it comes to customizing window shapes and sizes. Our team specializes in working with home builders to install new construction windows directly into the framing of the home. Our team of expert window installers is the foundation of our business. To offer only the best to our clients in Barrie, we hire the most dedicated and detail-oriented tradespeople. We also offer our clients a unique lifetime warranty on all our products – free of charge. I’m thinking of replacing the windows in my home in Barrie. How do I receive a free quote? Please contact our office directly to schedule your no obligation, free in-home estimate with one of our trained specialists. Do you install windows during the winter months in Barrie? If so, how long does the total installation process take? Absolutely! We do installations 12 months a year, however, our installation process is a little different during the colder months due to keeping your energy costs in mind. Typically, we can complete window installations within one day. What are the benefits of replacing the windows in my home in Barrie? The biggest advantage to replacing your windows with our energy-efficient windows is the reduced energy cost to heat and cool your home. New, high-efficient windows also add curb appeal to your home and increase its overall value. I feel a cold draft coming in my home during the winter in Barrie. What types of windows are most recommended for increasing my home’s energy efficiency? We cater to many different situations to offer the best fitment of windows or doors for your home. As a result, you will notice a dramatic increase of energy efficiency and comfort levels. I live in an old home in Barrie. Will your windows fit my home’s unique window specifications? We custom-make our windows and doors to suit whatever requirement is needed. We understand that each home is unique, so we take care to ensure we have suggested the proper fitment for each opening. I live near the lake in Barrie. What types of windows are most recommended for living on the waterfront? All of our energy-efficient window options will work for homes located on the waterfront. Casement windows, however, are the most energy-efficient window option that can open. If I order new windows for my home in Barrie, how long will the total installation process take? In most cases, we can install new windows in as little as 5 weeks. My house in Barrie doesn’t have much natural light. What types of windows are most recommended for letting in more natural light? Our picture windows would provide the most natural light, not to mention, it is the highest rated energy-efficient window option to install. Are there any elements of my home’s exterior that would need to be removed when installing new windows? In most cases, we measure our windows to fit from stud-to-stud in the openings. As a result, there is no need to remove any exterior elements of the home that are not associated with the window. What is the most cost-effective window option for my home in Barrie? We have several different window options available for your unique home. We encourage you to contact us directly for your free, in-home estimate, so we can cater to the exact needs of your project. Barrie is regarded as an urban growth centre due to recent population increases of commuters who live locally but work nearby in the city of Toronto. The city of Barrie is a hub for endless winter and summer recreational activities, live theatre, unique restaurants, historic museums, cultural galleries, and local shopping. Known commonly as the “Gateway to Cottage Country,” the city of Barrie is located near the western shore of Lake Simcoe. Barrie is situated between Ontario’s serene cottage country and the hustle and bustle of the Greater Toronto Area. Barrie’s close proximity to numerous bodies of water such as Lake Simcoe and the Great Lakes creates heavy snowfall during the winter months and high humidity during the summer months. The population of Barrie is approximately 145,000, marking it as the 34th largest city in Canada. Each year, the population of Barrie rises due to an urban sprawl from major cities nearby. As part of a region that produces one quarter of Canada’s Gross Domestic Product, Barrie businesses have access to 9 million people within a 100-mile radius. Barrie’s Georgian College is also home to 35,000 full-time and part-time students. The city of Barrie was first settled during the War of 1812 as a key supply location for British forces. Twenty years later, the city was named after Royal Navy Officer Sir Robert Barrie, who consistently commanded forces through the region. To this day, Barrie has preserved much of its history through the upkeep and maintenance of many original buildings. The historic structures in the downtown core and along the waterfront are some of the most popular tourist hotspots in Barrie. The “Spirit Catcher” is a large, birdlike sculpture on the waterfront, believed to carry out the dreams and desires of those who visit the sculpture. Tourism encompasses a large portion of the local economy in Barrie. Numerous festivals attract thousands of visitors to the city each year, including the Barrie Waterfront Festival, Winterfest, Celebrate Barrie, and the Barrie Film Festival. Barrie’s labour force consists of a talented and qualified stream of seasoned professionals and recent graduates of Georgian College. In addition to Barrie’s arts and cultural festivals, the city attracts thousands of visitors each winter for seasonal activities such as skiing and snowboarding. Blue Mountain, Horseshoe Resort, and Mount St. Louis are among the most popular destinations for winter recreational activities in Barrie. Popular in the summer months as well, Barrie is known for its exceptional hiking trails, golf courses, and waterfronts. Barrie is centrally located approximately 100 kilometres north of Toronto, surrounded by numerous smaller cities and towns including Innisfil, Bradford, Collingwood, Owen Sound, Gravenhurst, Orillia, Newmarket, Alliston, Tottenham, and Angus. From the moment you connect with us, you’ll know right away we’re different from our competitors. We understand that each client’s need is unique, so we take care to listen to your specific requirements before we prepare a detailed quote. We appreciate the care you have for your home by investing in its upkeep, which is why we will strive to provide you with the best possible window experience in Barrie.